Let’s start with a riddle for cooks: What biblical plant might you use regularly without knowing it appears in the Bible? If you saw it in a jar, you’d probably recognize it, I tell people when I point it out, for example on a hike up to the David Spring at En Gedi. 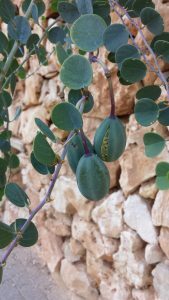 It thrives among the rock terraces around my Judean Mountains home of Har Adar, in the desert and among the stones in the Western Wall, and makes a perfect end-of-summer botanical tale. The answer is – the caper. 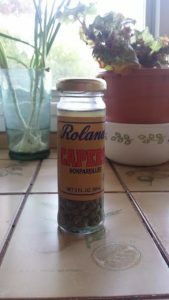 Capers as most people know them best…pickled in a bottle. 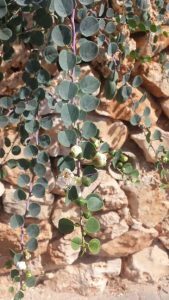 The caper (Capparis spinosa), appears by name only once in Scripture, in Ecclesiastes 12:5, in a dour reference to old age, when “the caperberry shall fail.” But Rabbi Gamaliel, Paul’s teacher, was otherwise inspired by the caper. Looking at Ezekiel’s vision of messianic times when “trees will put out branches and bear fruit” (Ezek. 17:23), he deduced that “not only would it put out a new branch every day, but new fruit every day as well (Babylonian Talmud, Shabbat 30b). His example? The caper. True, Rabbi G.! The caper bushes I passed on my summer morning walks produced new flowers every day. A single hot summer day is enough to shrivel them, leaving behind a nascent fruit. A caper bush growing out of a wall in my neighborhood. The caper bush is also known for its small, mean thorns, the source of one of the plant’s Hebrew names: tzalaf. That brings us to another intriguing connection. Numbers 27:1–8 tells us about the five brother-less daughters of Zelophahad, who came to Moses asking that they be allowed to inherit land just as sons could. 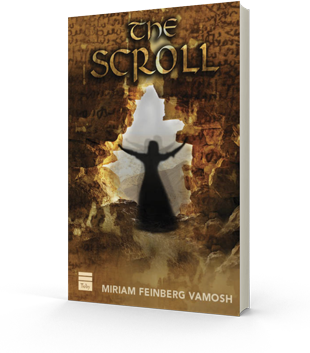 In making their case to Moses, the women mention that their father had “died in his own sins” (Num. 27:1). What were these? 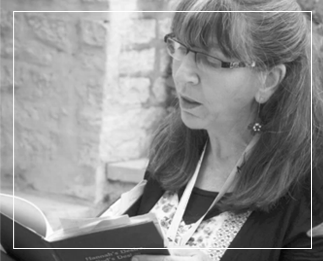 The Bible doesn’t say, but leave it to Rabbi Akiva to fill in the blank. Zelophahad – Tzalaf-khad in Hebrew, he says, means “sharp caper.” Nogah Hareuveni, founder of Neot Kedumim, the Biblical Landscape Reserve, explained that Rabbi Akiva (Babylonian Talmud, Shabbat 96b) believed Zelophahad’s name identified him as the man God ordered put to death for gathering kindling on the Sabbath (Num. 15:32–36). That’s because Rabbi Akiva, a shepherd before his career change, would have spent more than his share of rainy winter days in pastures where dry kindling was hard to come by. But nearby would have been plenty of capers, which thrive in the dry summer, go bone dry in the winter. The downward thorns that flank each caper leaf appear in an allegory in the ancient Jewish source Genesis Rabba and in various versions in other cultures. They starred in the coded message second-century leader Rabbi Joshua Ben Hananyah gave to his people, to stick to moderation despite growing Roman oppression. He told a story about a lion gagging on a caper stalk, which the king of beasts cannily persuades a passing crane to extract using its long beak. What was in it for the crane? Suffice it to say that no version of this allegory ends well for the bird. 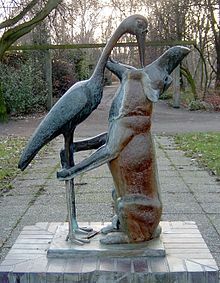 Sculpture, wolf playing the part of the lion, by Stefan Horota, 1968, in Berlin’s Treptower Park. Wikipedia. My favorite caper image comes from another second-career, second-century sage: the former gladiator Resh Lakish. He said: “Three are distinguished in strength: Israel among the nations, a dog among the animals, a rooster among the birds, and some say the goat among cattle, and some say even the caper among the trees” (Babylonian Talmud, Beitza 25b). And from the metaphorical point to literal and back again: May all among us facing the shallow soil of challenge and adversity these days bloom and thrive through it all, like a caper out of the rock. 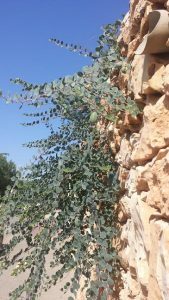 Noga Hareuveni, Trees and Shrubs in our Biblical Heritage.